If you are renting out a home or business in Brighton, MI, there are ways you can attract great tenants who want to stay in your home, apartments, or condos with the right professional property maintenance services. As a property owner or property management company, you want to be sure you attract potential tenants who will treat the property right, pay their rent on time, and stay as long as possible – and property maintenance in Brighton is the key. Again, whether you have a Brighton commercial or residential property, the landscaping, walkways, patios, and other exterior areas need maintenance. An overgrown lawn, bushes and trees that grow wild, leaves all over the place, ant infestation, or a dead lawn only makes your Brighton property look run down. With property maintenance, your Brighton property looks well maintained and will attract new tenants and keep existing tenants happy. Speaking of keeping existing tenants happy, did you know that Brighton and other areas of the country are now offering tenants property maintenance as part of the lease package? Tenants are flocking to these properties that they don’t have to keep up themselves. Landscaping maintenance can be offered to tenants on the lease, and is a very affordable option especially if you use a property maintenance company who can get it done for you. Having the lawn mowed, the irrigation system repaired and useful, the bushes trimmed, and everything handled for them, is a very attractive lease package. With irrigation, your Brighton property will have a great looking lawn all year long and for years to come. It takes time to build up healthy turf, it doesn’t happen in just one season. When the Brighton lawn goes unwatered because you left it up to tenants to move around portable sprinklers and hoses, the lawn can easily get dried out. Once the grass and other foliage suffers from a drought, it’s very difficult to bring it back to life. Automated irrigation systems are key for a healthy lawn that attracts and keeps Brighton tenants. Installing an irrigation system and keeping it in good repair is a great way to bump up the value of your Brighton property. Your Brighton property, whether commercial or residential, has to compete with other properties in the area for tenant attraction and retaining. If someone is wanting to rent a Brighton home or business space, they will be looking around quite a bit for the right place. It’s important, then, to be sure you have landscaping done that is attractive and beautiful. Tenants will choose your Brighton property over others that don’t have landscaping. 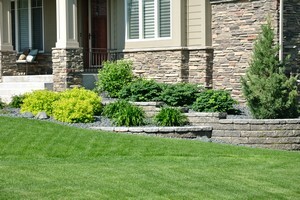 Your landscaping can be as elaborate or simple as the home is. For simple landscaping options, let your Brighton landscaper help you choose the right bushes, tree and bed mulching, and flowers. Flowers add a vibrant color to the exterior for extra curb appeal. If you would like to learn more about Brighton Property Maintenance, please call 734-564-1373 or complete our online form.